Simple Beauty begins with “The Vamp,” which is a brief, driving vamp with tenor sax, piano, bass, and drums in 3/8 time. “Good Day Without You” transfers the vamp from the first cut to a lower mid-tempo 4/4 meter and adds to it an elegant, post-bop melody played by Larson on tenor and Nils Weinhold on guitar. Larson then plays a lyrical solo, employing a big, clean sound and playing flowing, complex lines that remain firmly within the harmonic structure of the tune. Then Can Olgun plays a solo on piano that consists mostly of single lines, somewhat in the style of Brad Mehldau. Larson and Weinhold then play the melody again until just the vamp remains, over which bassist Raviv Markovitz plays a straightforward, melodic solo to the end of the cut. “Away Intro” is an a brief but strong a cappella improvisation from Larson on tenor, which leads to “Away,” one of the two tunes on the recording composed by Weinhold, the remainder having been written by Larson. “Away” has a slow, pensive melody played in unison by tenor and guitar, with barely-there drumming from Jason Burger. Then Weinhold plays a graceful solo with deliberate, simple lines free of technical flourishes. Larson’s tenor solo has more intensity, and the rest of the group ramps up its intensity level as well. The group preserves some of this passion during the final reading of the melody but then brings things down to quietly close the cut. “Loophole” is a driving, mid-tempo tune with Olgun on electric piano, first playing a vamp and then a repeated melodic figure. Then Larson and Weinhold play a complex melody in unison. Larson brings to mind Michael Brecker’s creativity in his solo, rolling out one complex phrase after another, using the full range of the horn. Weinhold plays another melodic solo, showing off some technical flash as well. Larson and Weinhold then play the tune’s intricate melody to close the cut. “Simple Beauty” has Larson on soprano sax, displaying an attractive, full sound with heavy vibrato. This is a slow-paced, balladic tune without any clear meter and with Markovitz laying out, giving the tune a lighter feel. Larson starts out his solo with restrained phrases, then he adds some intensity to his lines and moves into the upper register of the soprano, and then he slows things down to end the cut. “Odd Man Out” has Olgun on electric piano again, along with a hint of spacy guitar. This is an upper mid-tempo tune in a subtle 5/4 meter. Larson, back on tenor, and Weinhold are again in unison on a subdued melody, and this tune gets played out without improvisation. “Strong Mind, Strong Body” is an upper mid-tempo tune with shifting meters, and guitar and tenor play the tricky melody. Weinhold starts off the improvising with a technically accomplished but always musical solo. Larson weaves a long, impressive solo, occasionally gliding with ease into and out of the altissimo register. Olgun contributes a well-developed piano solo. Then the drummer (I’m not sure if it’s Jason Burger or Guilhem Flouzat) gets the spotlight, merging his solo into the group’s vamp. Larson plays the slow, pretty melody of “No Words” on tenor, employing plenty of vibrato, with Weinhold occasionally adding some spice with his quiet guitar. The rest of the group blends in seamlessly during Larson’s gentle improvisation. This cut really shows off the empathy of these players for each other. “Tiny Conferences” is another delicate, meter-shifting, mid-tempo melody played in unison by Larson and Weinhold. Olgun again plays a solo with controlled, Mehldau-like single lines. Larson engages in some of his most intense playing on this cut, reminiscent of Michael Brecker’s rhapsodic playing on “Every Day (I Thank You)” from Pat Metheny’s 80/81 album. The recording ends with “Song With a Bridge,” the second tune by Weinhold, which has Larson’s tenor accompanied by Weinhold on acoustic guitar, playing a slow, folk-ish melody, leaving off any improvising. Simple Beauty seems inspired by Pat Metheny/Michael Brecker collaborations, and it has a generally light feeling, largely due to understated drumming. This debut recording reminds me of another debut recording, Geoff Vidal’s She Likes That, previously reviewed here on AJS. The compositions of Simple Beauty are lighter and more streamlined than those of She Likes That, but both recordings feature guitarists prominently, and they are mainly showcases for the saxophonists. Vidal and Larson have somewhat similar approaches to the tenor sax, displaying effortless virtuosity and endless inventiveness within tight harmonic constraints. And both are very young. 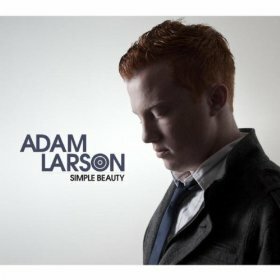 On the strength of his debut recording, great things can be expected from Adam Larson.